I'm on a roll! I'll run out of Wyndhams eventually, and will then have to move onto something else, but as usual when I re-read something, I'm finding new things resonating with me. My much loved, battered edition of this book is an ex-library copy I picked up in a sale somewhere many years ago. I wish the cover wasn't quite so bashed around, as the drawing - what can be seen of it - is a wonderful loose, soft pencil sketch. However, Midwich IS quiet. It is renowned as being a place where, almost literally, nothing really happens. To celebrate both his birthday and a recent contract with an American publisher, Richard and Janet head to London for a night away. Coming back the next day, they find, much to their surprise that they can't get back into Midwich. Nobody can. Disobeying the orders of the policemen on the road, they back up, and then have a shot at getting in across the fields. Halfway across, without warning, they both collapse, unconscious. They're pulled out by the emergency services finding, much to their confusion, that they had no sense of any of it happening - one moment they were running across the field, and the next, they were being pulled along the ground by a hook. An area of some two miles diameter and some six thousand feet high is inaccessible. Blurry, distant photographs show a large, almost circular shape in the centre of the area, but no one can get close enough for sharp focus. As mysteriously as it begins, the Dayout - as it becomes known - is suddenly over after two nights. The village wake up as confused as Richard and Janet, having no sense of the time that has passed and things start to settle down again. Until, one by one, all the women of childbearing age in the village discover that they are pregnant. The married ones aren't overly concerned initially, but the single ones, young and old, are shocked and frightened. When the babies are born, they appear normal, apart from their distinctive golden eyes. It isn't until they're a few weeks old that anyone is aware of anything radically different about them - when the women who left Midwich before giving birth start to arrive back - forced by their babies. By the time they're two, they have the appearance of an average four year old, and Zellaby has worked out that the will they exerted on their mothers as individuals isn't an individual characteristic at all, it's part of a collective consciousness that is separated by gender. He convinces Richard and Janet via experiments with simple puzzles, picking out a boy and then later a girl to try them on - once one boy can do the puzzle, all the boys can. Likewise the girls. 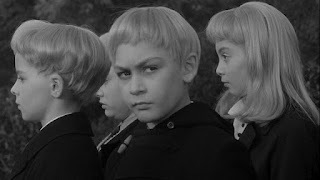 ...all these sixty-one golden-eyed children we have here are intruders, changelings: they are cuckoo children. Now, the important thing about the cuckoo is not how the egg got into the nest, nor why that nest was chosen; the real matter for concern comes after it has been hatched - what, in fact, it will attempt to do next. And that, whatever it may be, will be motivated by its instinct for survival, an instinct characterized chiefly by utter ruthlessness. Zellaby's ruminations over the years about the Children develop further along these lines. The event that precipitates the crisis is the annihilation of a village in Russia with another group of Children - the only other surviving group. 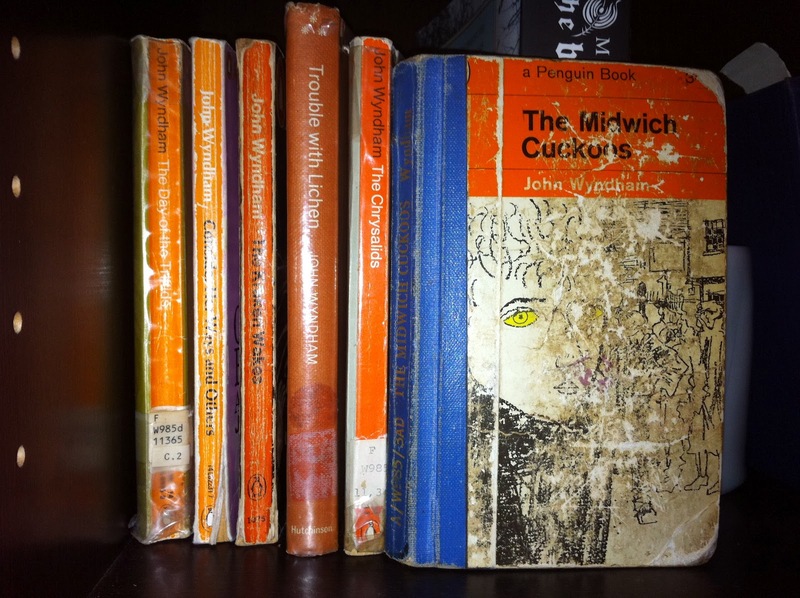 Consequently, the Midwich Children are placed in a situation where they have to do whatever is necessary in order to survive. As is common to us all in youth, their reactions to perceived attacks - honest accidents on the part of the villagers initially - are extreme. Members of the village die or are badly injured in the following events, until the Children shut down the village, realising that they have no option but to deliver an ultimatum - matters have come to pass as Zellaby predicted, much earlier than anyone, including the Children, could have anticipated. Apparently, at this point they hold all the cards. If the authorities attempt any form of liquidation, the villagers lives will also be lost, and the Children are well away that English culture and ethics won't allow that to happen. However, they reckon without the Trojan horse in their midst. Zellaby has spent considerable time with the Children over the years, teaching them, showing them films, studying them covertly. He has managed to get as close to them as anyone could have, given the vast divergence between the species. He is, unknown to his wife or anyone else, close to death - what ails him is never spelled out, but there are clues that it may be a heart condition. Knowing that he doesn't have long, he clearly makes a decision that will cost him his life, but will benefit everyone else. He plants a bomb in amongst his equipment when he goes to The Grange for one of his movie nights which always draw all the Children. Midwich and the world are saved when, in a mighty blast, The Grange is leveled. 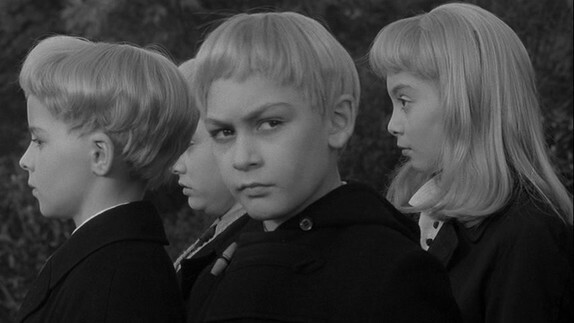 The Midwich Cuckoos was filmed twice, both times as The Village of the Damned. The first film, made in 1960 and directed by Wolf Rilla is said to be fairly faithful to the original, and if you do a hunt on Google images for stills, there are enough that recall exact scenes from the book to back that up. However, the 1995 remake, directed by John Carpenter is apparently a different beast altogether. The story is relocated to California, only ten women mysteriously fall pregnant, and according to the various reviews I read online, its marked difference is the use of graphic violence - and the scenes described weren't in the original book. I've not seen either film, although I must admit, I'm now a little curious about the original 60s version - I remember the promos for the 95 film. I was initially excited and then realised that I'd be, at best, disappointed, and at worst, offended. My reading prior to writing this post hasn't changed that feeling. The title change intrigues me - I get that a movie is a new product. However, Wyndham's choices of language and metaphor are such an intrinsic part of what make his books so powerful that I think there is something valuable lost in the change. Zellaby's conversation with Alan that I quoted earlier speaks to this - the analogy of the Children as cuckoos is masterful. It brings matters back to something primal in a way that we rarely do when we discuss human survival. We all too easily forget that we form part of a biological hierarchy on the planet and the only reason we sit at the top is because of our brains and our ability to reason and deal with abstractions. Wyndham hauls us unceremoniously back into that primeval struggle for survival - Zellaby himself posits that it is our complacency that prevents the people dealing with the Midwich situation from acknowledging that all we need to be ousted from our position at the top is to be supplanted by a superior species - but no one is willing or able to grasp that the Children may well be that threat. They're just small 'c' children in the eyes of most people. Children who, despite their differences, can be taught, in time, proper social skills and acceptable behaviour. Wyndham wrote this book in 1957, ten years or so before Chocky. With Chocky, we again have a seemingly benign invasion - there is no intergalactic war, no apocalypse, no great crumbling of our civilisation due to a vastly advanced technological force. There is just a scout who comes to check our Earth through the channel of a small boy. We get caught up in that relationship and the resulting events - and we forget that what is planned, if Earth is found suitable, is colonisation; which also means, in all likelihood, our demise. In the famed tagline from The X-Files, "They're out there..." Such is the subtlety of Wyndhams' stories that we can, seriously, be left wondering if that really is the case. I love all these books.....incidentally read a spin off of Day of the trifids earlier this year I think. Called night of the trifids. Interesting. Hi Rach - I re-read these every year...one of the reasons my copies are so worn! I've not seen that spin off - sounds weird. I'll have to chase it up. Excellent post, you do make me want to re-read all of the Wyndham novels. I love these books so much. Been reading them since my teens and they just don't date. Loved your latest post too - have to go back and read it again and leave a comment there! Hi, Kaz! I really enjoy reading your reviews, almost as much as the Wyndham novels themselves! Hehehehe. Anyway, I'm still looking for the movie adaptations of this work. I haven't seen any from a video store yet. Thank you! I'm glad you're enjoying my stuff - I'm enjoying writing them. I haven't started hunting for the movies - I'm not really interested in the recent one, it's the early one I want to get my hands on. If you find it, let me know so I can hassle my DVD shop guys!